(4/7/98; 1800 hrs) The Chapel Net Secretariat Office, which will be set-up at the former LST Administration offices will be fully functional and operational starting Tuesday after the Easter Sunday. (4/7/98; 1806 hrs.) The SemNet volunteers are asked to report immediately to the secretariat on the status of PPCRV, NAMFREL and VOTE-CARE in their respective places. As of: Monday, April 20, 1998. 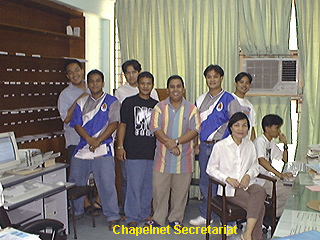 9:00 a.m.
As of April 13, 1998, the secretariat of Chapel Net is in place in the former offices of the LST Administration. It is being manned mainly by seminarians from UST, San Carlos and San Jose. The Secretariat meets daily at 9:30. On Tuesday evening at 8:00 we still have our coordinative meetings with non-seminarian members. Since April 13 we have contacted 49 dioceses by phone. We are in e-mail contact with 19 dioceses. We are still trying to make contact with 20 dioceses. Nine of the contacted diocese requested for materials. These are sent by DHL if the diocese has no access to our Homepage. The Chapel Net Homepage is still probably the most comprehensive collection of non-partisan material on the coming election. Bong Eliab is the Webmaster. It needs more frequent updating. Fr. Joel has been asked to contribute to three brief Pastoral Statements for Cardinal Sin for the three Sundays prior to the election: May 10, May 3 and April 26. Two are already written. Through Chapel Net, Kim Lachica has been able to play a powerful coordinative role with especially PPC-RV and Namfrel. He is the recognized Jesuit point person liasing directly with these organizations. The Namfrel Tabulation Center at AdMU seems to be well set up. Software created by the Ateneo students is praised as better than official STI software. With other members of Chapel Net, Kim attended the last National Assembly of the PPC-RV. Last Saturday, he organized and hosted an important PPC-RV, Namfrel, PNP, COMELEC (and DECs [absent]) whole-day coordinative meeting in the Tipanan ni San Ignacio. The subsequent invitation by COMELEC to PPC-RV and Namfrel to join its own organizations meetings (unprecedented!) is considered a breakthrough. At the request of the delegates of the National Assembly of PPCRV, Simbahang Lingkod through Chapel Net will produce a novena of election-related prayers and three Homily Guides for the three Sundays prior to the elections. The first of the latter will be ready by Wednesday at the latest. At the suggestion of Namfrel and PPC-RV we are now organizing a Seminarians-Priests and Religious Task Force ("SPIRIT FORCE") to perform poll watching in hotspots in the Metro Manila Area. We are calling for a special assembly on Thursday afternoon. Through Simbahang Linkod, Johnny Go has completed an excellent documentary on elections entitled: "Eleksyong Pinoy." This will be aired on commercial media, but a special showing will be held in the Cardinal Sin Center of LST after the SPIRIT FORCE meeting on Thursday. Simbahang Lingkod ng Bayan will be conducting Poll Watching Training Seminars in the LST classrooms, possibly on an ongoing basis till election week.